PLAYWRIGHT Harold Pinter was an experienced adulterer. In the 1960s, during his marriage to actress Vivien Merchant, he had a seven-year affair with television presenter Joan Bakewell, wife of producer/director Michael Bakewell. 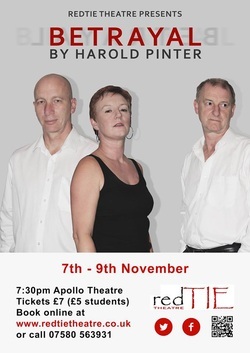 Betrayal, staged at the Apollo by RedTIE Theatre last week, was based on the Bakewell affair and regarded as one of Pinter’s major works. It was an inspired choice by RedTIE director John English. The main roles were played by Helen Reading, Paul Gwinnett and Steve Reading (Helen’s on and off-stage husband). Dan Stotesbury played the waiter. Betrayal uses reverse chronology to structure the plot. The first scene took place after the end of the affair, when the woman’s marriage is breaking down. The final scene depicted the start, when the woman is reluctantly seduced by her husband’s apparently infatuated friend. The script is a masterpiece, exploring betrayal and hypocrisy on many levels. The male lover is angry and hurt when the woman becomes pregnant by her husband. The woman deceives not only her husband but her lover, weaving a web of lies about her husband’s discovery of the affair. Excellent performances made this a very watchable play. I was intrigued Pinter depicted himself negatively, as a selfish, manipulative man, who coveting his friend’s wife, but ultimately behaved in a cruel and uncaring way towards her. Actors often have to face the challenge of growing older on stage, but in Harold Pinter's Betrayal they have an even more difficult task: they have to grow younger as the play progresses. Pinter's play tracks the course of an affair, but it does so backwards: it opens with a meeting between the two lovers some years after the affair ended; it finishes with the first erotically charged encounter between the two, nine years earlier.